UPDATE: THE NATIONAL VACCINE INFORMATION CENTER HAS CONFIRMED TWO VIROLOGISTS, STEPHEN KRAHLING AND JOAN WLOCHOWSKI HAVE FILED A LAWSUIT AGAINST THEIR FORMER EMPLOYER AND VACCINE MANUFACTURER MERCK. NVIC WRITES: “THE LAWSUIT ALLEGES THAT MERCK DEFRAUDED THE U.S. FOR OVER 10 YEARS BY OVERSTATING THE MMR VACCINE’S EFFECTIVENESS. THE VIROLOGISTS CLAIM IN THEIR LAWSUIT THAT THEY ‘WITNESSED FIRSTHAND THE IMPROPER TESTING AND DATA FALSIFICATION IN WHICH MERCK ENGAGED TO ARTIFICIALLY INFLATE THE VACCINE’S EFFICACY FINDINGS.” NVIC PRESIDENT AND CO-FOUNDER, BARBARA LOE FISHER, WARNS OF THE DISTURBINGLY COZY RELATIONSHIP AND OVERWHELMING CONFLICT OF INTEREST BETWEEN FEDERAL AGENCIES CHARGED WITH VACCINE SAFETY OVERSIGHT (SUCH AS THE CENTERS FOR DISEASE CONTROL) AND VACCINE MANUFACTURERS. MERCK’S GLOBAL VACCINE SALES TOTAL MORE THAN $20 BILLION A YEAR. Allegations of Scientific Misconduct by GACVS/WHO/CDC Representatives et al. As a medical doctor and scientist, I write to present grave concerns regarding the conduct of certain members of the Global Advisory Committee on Vaccine Safety (GACVS), the World Health Organization, the CDC and other scientific/health professionals during the time shortly before the public hearing on HPV Vaccine Safety which was held in Tokyo, Japan on February 26, 2014. I have come into possession of documentation which leads me to believe multiple individuals and organizations deliberately set out to mislead Japanese authorities regarding the safety of the human papillomavirus (HPV) vaccines, Gardasil® and Cervarix®, which were being promoted at that time. I am sure you are well aware of the controversy currently surrounding these vaccines on a global level. I am also sure you are aware of the fact that public confidence in national and international health authorities is at an all time low throughout the world. Should the information in this letter prove to be accurate, nothing short of an immediate independent investigation resulting in appropriate disciplinary actions for those involved will be able to restore the public trust. Therefore, I implore you to act quickly and decisively regarding this critical public health issue. Affairs 2012, S12:001] was about HPV L1 VLPs. The authors of reference 13 never mentioned HPV L1 gene DNA fragments at all. Dr. Pless knew the difference between HPV L1 VLPs and HPV L1 gene DNA fragments because in his February 18, 2014 email addressed to Dr. Helen Petousis-Harris and the others involved in this scheme, Dr. Pless specifically asked Dr. Petousis-Harris to address her “statement regarding the alleged role of aluminum binding to DNA fragments and subsequent effects.” (see copy of February 18, 2014 email attached- It was not about HPV L1 VLPs). One cannot help but conclude that Dr. Pless intentionally put these two unrelated articles together and claimed that both articles studied HPV L1 gene DNA fragments in order to mislead the non-scientific readers and vaccination policy makers. Click link above for full article/letter. In case you have not heard, Dr. Sin Hang Lee, a scientist and doctor, has written an open-letter of complaint to Dr. Margret Chan, the Director-General of theWorld Health Organization (WHO) alleging misconduct and cover up of HPV vaccine dangers by global health officials. The source of information for Dr. Lee’s letter is a trail of emails and other communication between global health officials obtained via an Official Information Request in New Zealand. 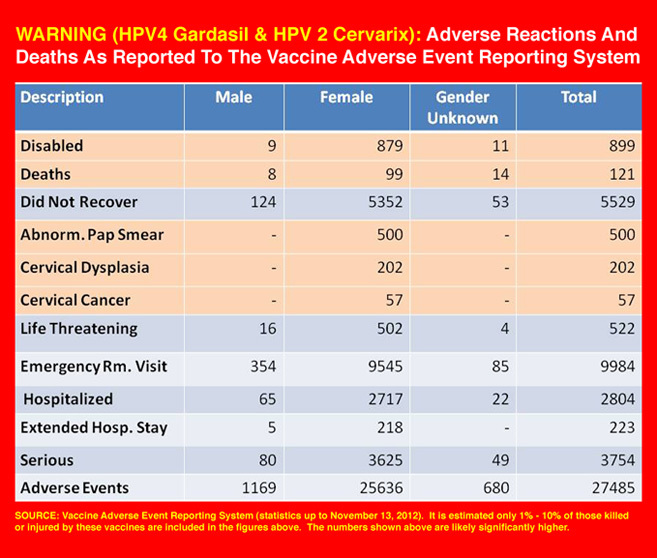 The trail of communications provides evidence that global health officials knew that HPV vaccines Gardasil and Cervarix cause a dangerous inflammatory response greater than other vaccines but reassured the public that the HPV vaccines were safe, aided by a seemingly dishonest New Zealand doctor. Read our post on these revelations to get the full story. Dr. Lee asked us to post the entire trail of communications on our website for the entire world to see and review. Please spread the word and look for yourself to see what these officials charged with protecting the public health are really up to. Reports of official cover ups of vaccine dangers seem to be a recurring theme. Last year Dr.William Thompson a senior CDC scientist turned whistleblower revealed that he and other scientists and officials at CDC altered data in one of CDC’s studies to conceal the connection between the MMR vaccine and autism. Then as detailed by Congressman Bill Posey in his official comments on the floor of the US House, this same group of scientists and officials met in a conference room and covered their tracks by destroying the documents. Now comes news that health officials like Dr. Melinda Wharton of the Centers for Disease Control and Prevention (CDC) as well as officials from Japan, other nations and the World Health Organization all participated in covering up the dangers of HPV vaccines Gardasil and Cervarix. Dr. Sin Hang Lee, MD, Director, Milford Molecular Diagnostics Laboratory, has submitted an official, open-letter of complaint to the Director-General of the World Health Organization (WHO), Dr. Margaret Chan, alleging gross misconduct, malfeasance and what potentially amounts to criminal behavior to mislead the global public regarding the safety of HPV vaccines Gardasil and Cervarix. Dr. Lee’s lengthy letter detailing communications between global health officials documents that these officials knew that HPV vaccines cause an inflammatory reaction greater than other vaccines, yet reassured the public in official hearings and statements that the vaccines were safe, aided by a seemingly dishonest New Zealand doctor. Specifically, certain chemicals contained in the HPV vaccines have been demonstrated to trigger the release of cytokines or proteins called tumor necrosis factors (TNF) in the body. TNF cytokines can cause cell death. The release of TNF can also result in a wide range of reactions such as tumor regression, septic shock (serious whole-body inflammatory response that can result in dangerously low blood pressure and death), and cachexia (a wasting syndrome where the body loses weight, becomes fatigued, and muscles atrophy). Administration of TNF has been proven to cause death in humans and animals. The chain of emails shows what appears to be attempts to conceal the truth, cover up the dangers, and generally mislead the public about what is and is not known about HPV vaccines and the dangers inherent to them. The officials discuss how to respond to the safety concerns raised by legitimate scientific inquiry rather than how to ascertain the true extent of the dangers uncovered in the independent research. Official statements appear to be a deliberate attempt to confuse the public into believing the safety concerns have been addressed in the peer-reviewed, published scientific literature when this is not the case. They imply that two different chemicals in the vaccines, HPV “virus like particles” and HPV DNA fragments are the same and that science has proven they are not dangerous but neither assertion is true. They are not the same and the only “science” is something ghost-written by CDC and a blogpost written by the aforementioned seemingly dishonest New Zealand doctor. Proof of this claim does not exist in the published, peer-reviewed literature. The open letter, alleging what amounts to crimes against humanity if they are proven true, is a wake-up call to officials around the world. An immediate investigation must commence, and all HPV vaccines should be withdrawn from the market immediately. In addition, all vaccines should be subjected to further review, and a Congressional investigation of CDC Whistleblower William Thompson must commence. You can read Dr. Lee’s open letter to the WHO Director-General here. You can read the entire chain of communications obtained by an Official Information Request in New Zealand here: Official Information Request Document. # of poisons (vaccines) injected into babies/kids to age 18 as of 2013 – more planned. Continue reading # of poisons (vaccines) injected into babies/kids to age 18 as of 2013 – more planned. Format ImagePosted on January 10, 2016 January 10, 2016 Categories # of Required Vaccines, Gardasil, HPV Flyer, VACCINESTags # of Required Vaccines, Gardasil, HPV Flyer, NVICLeave a comment on # of poisons (vaccines) injected into babies/kids to age 18 as of 2013 – more planned.